Every spring, the clear upland streams of eastern North America erupt in vivid shades of red, yellow and blue. These displays are not caused by flowers, but by the breeding colors of minnows. Before the fireworks can begin, a particular type of minnow called the bluehead chub must complete a very important task. After fattening up on insects, adult male chubs (up to 7 inches long) construct large, dome-shaped piles of gravel in swift current. These mounds are chub nests, and they cost a great deal of energy to make. A large male chub may carry over 7,000 stones, each as large as his head, as far as 25 yards to his nest site. Chub nests can be up to two feet tall and three feet long, and are built in as little as a day…quite impressive for a fish the size of your hand! Much like the nests of birds, chub nests help to attract mates and are a safe hiding place for eggs. But female chubs are not the only fishes attracted to chub nests. Over 30 other minnow species are known to spawn on chub nests. These fishes exhibit some of the most amazing colors found in the fish world. Because of their remarkable coloration, nest associating minnows are prized by aquarists around the world. 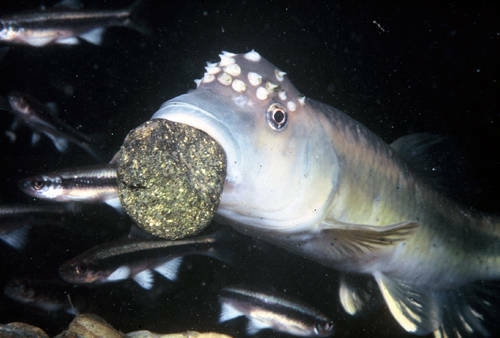 When laid together on nests, eggs of chubs and other minnows may survive better than if they had been spawned alone. Because this relationship is mutually beneficial to participants, spawning aggregations on chub nests are considered to be positive interactions. Until recently, most fish ecologists have focused on negative relationships such as those between predators and prey. 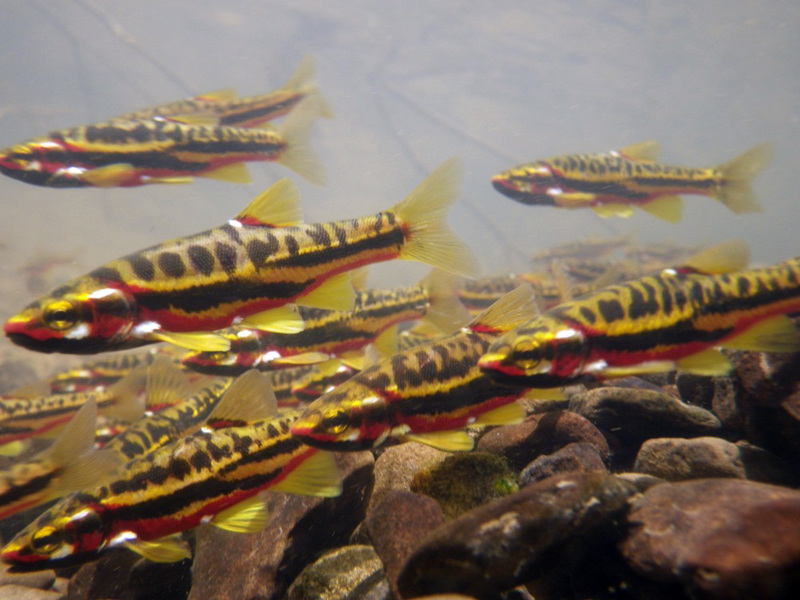 In fact, positive interactions among stream fishes have been nearly entirely ignored. Terrestrial ecologists have long understood the importance of conserving positive relationships among species. For example, agronomists understand that the positive interactions between bees and plants are essential for successful crops, and plant ecologists appreciate the mutual tradeoffs between soil dwelling fungi and plant roots. So then, how do we find the positive side to such a harsh “fish eat fish” world? Emerging research shows that positive interactions between chubs and other minnows may be as important as negative ones. Firstly, many nest associating minnows are much more adept than other minnows at colonizing historically degraded habitats. These minnows need clean gravel to spawn—often a scarce commodity in agricultural or urban streams. By building nests, chubs can create “islands” of clean gravel in a stream full of silt. Further, we have found that many nest associate species (inhabiting the New River basin, Virginia) tend to be rare, in terms of geographic distribution. That is, most don’t live in the absence of chubs. Where do we go from here? 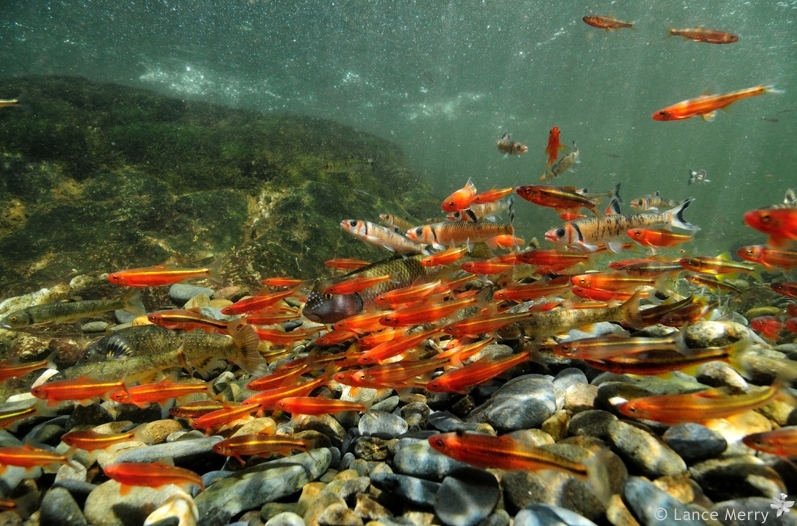 Aquatic biodiversity is declining at an alarming rate, especially in North American streams. To properly conserve this diversity, we must first understand the ecological interactions that promote it. That starts with folks who are interested in fishes—all hitting the creeks this spring with a mask and snorkel to see what lessons we can learn from one little minnow. Brandon Peoples is a graduate student at Virginia Tech investigating the role of chubs in river landscapes. They carry stones to construct nests!! That is actually amazing! Thank you. I am in Rappahannock County, VA and saw a mounded nest of rocks in a small (3 – 6 feet across) creek. I saw some smaller fish and one ca. 6 in. long fish that I could hear moving through the shallow water. The creek is in a pasture w/ cattle access, but we do not mow right up to the creeks and we do not overgraze, but I try to keep an eye on the creeks. I am grateful for the info here. I started researching chubs because we came across a warm shallow pool next to deeper water today which had what I now know was a school of Red Tailed Chub Minnows, about 4 inches long. There must have been upwards of 80 fish. So then, scrolling through other related images we saw the Bluehead Chubs and read your report about their amazing place in the ecology of Georgian streams (doubly amazing since we have somebody from Charlotte staying for a couple of weeks, and we are in Northern Ireland!) (That is a symbiotic relationship too…) Anyway, what fabulous little fish. Thank you for telling their story.